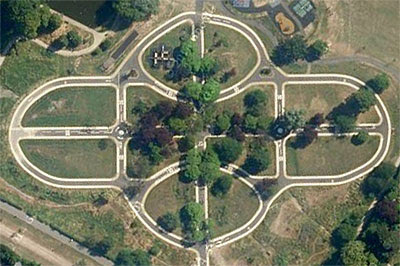 The park dates back to 1932, laid out on former farmland to serve the growing community round about. Its first special features were a Paddle-Boat Pond and a Shell Bandstand, these augmented in 1938 after the Park Superintendent had an idea to transform the southwestern corner. 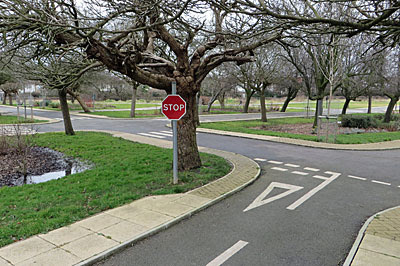 He planned a recreation area for small children to learn to ride bicycles, tricycles and toy motor cars, a training ground for road sense, and the Model Traffic Area was the end result. Three-quarters of a mile of roadway was laid out, with two main streets crossing at right angles and various narrower roads looping to either side. Miniature pavements ran along each side, the facility being as much for pedestrians as for road users, and the area was landscaped with trees and shrubs for added realism. The chief engineer of the Municipal Borough of Tottenham supervised the installation of miniature traffic lights and new-fangled Belisha Beacons, and a scaled-down blue Police box was added to teach children how to summon assistance by phone. The end result was a quintessentially Thirties experience, the Model Traffic Area, which from above looks something like this. The facility was opened on 27 July 1938 by none other than the Minister of Transport, the Right Honourable Leslie Burgin. Even better, footage of his plummy official speech exists and you can watch it on the Pathé news website. "Your kiddie of today, playing about with something that is a very instructive toy, is going to be the cyclist, the motor-cyclist, the van driver, the car owner of tomorrow. And if kiddies can learn road sense in the same way as a kiddie learns a language, so that it becomes an instinct, well then we have that much gained when they reach adolescence and later years." Such were the aspirations of the pre-war generation. Thirty model cars were available for hire from the park's 'Garage', at a going rate of one penny for fifteen minutes. Children could also hire one of the park's dozen bikes, or bring their own, on payment of a subsidiary charge. If that weren't enough fun, various items of playground equipment were scattered across the grassy islands, to ensure a steady stream of pedestrians waiting at the zebra crossings. Not surprisingly the place was packed out - over twenty thousand kiddies paid up during the first month alone - as this municipal vision took hold. The MTA had to be closed at the end of the following summer, but was reopened in 1947 for the delight of a new generation. The initial plan had been for this to be the first of many pioneering partnerships between local and national authorities, but the wartime hiatus put paid to that momentum and no further MTAs were built. 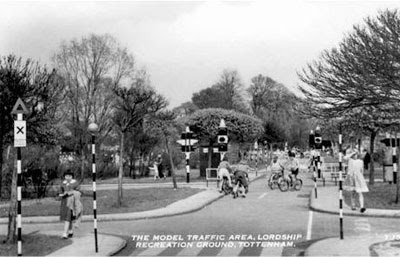 The Fifties were golden road safety years in Lordship Rec, and even in the Seventies the hire of bikes continued, but by the Nineties the Garage had closed and lack of maintenance had left the roads in a declining state. Local children still brought their own bicycles and learned to ride, but on an increasingly deteriorating facility. Step forward to 2010, and Tottenham residents were instrumental in sourcing a considerable injection of funds from the Lottery, Haringey Council and the Mayor. Some of this went towards relandscaping the River Moselle through the centre of the park, and some went towards restoring the Model Traffic Area. Its streets were repaired, its pavements relaid and a set of modern road signs added to bring the site into the 21st century. Alas there are no permanent traffic lights, they'd be too easily vandalised, but a portable set can be wheeled out when community groups use the upgraded network to teach cycle proficiency. I wondered how I'd missed the grand reopening of the Model Traffic Area on its 75th anniversary, but it turns out Queen Elizabeth Olympic Park reopened on the same day so Tottenham's moment in the spotlight was firmly eclipsed. Five hundred people turned up, two hundred of these on bikes, and the ribbon was cut by 82-year-old Barbara Leadbitter who remembered playing on this "wonderful" track as a young girl. And the MTA is once again a splendid sight, set across four acres in the corner of the park and looked over by a sculpture of a girl's bicycle - the motor car now pretty much banished. Its miniature roads weren't especially busy over the weekend, but I saw at least three sets of parents leading their offspring around the course at appropriately miniature pace. One appeared to be having trouble with his hill start, while another was clearly riding the wrong way down a one-way street in direct contravention of Highway Code section 69. 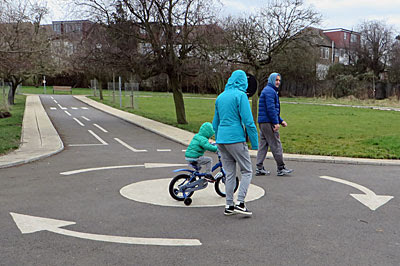 Perhaps more seriously a young chap with stabilisers careered straight across the centre of a mini-roundabout with total disregard for the road markings, complicitly encouraged by his jaywalking parents. The Rt Hon Leslie Burgin would no doubt have been aghast. For those who live nearby, in Tottenham or the eastern end of Haringey, the Model Traffic Area is a fantastic resource to have on the doorstep. Admittedly it's most useful for parents with children of bicycle apprenticeship age, and for giving N17's adolescents somewhere novel to hang out. But how excellent that Lordship Rec still boasts its unique playground for the imagination, thanks to the foresight of the Municipal Borough, and for the benefit of kiddies everywhere.